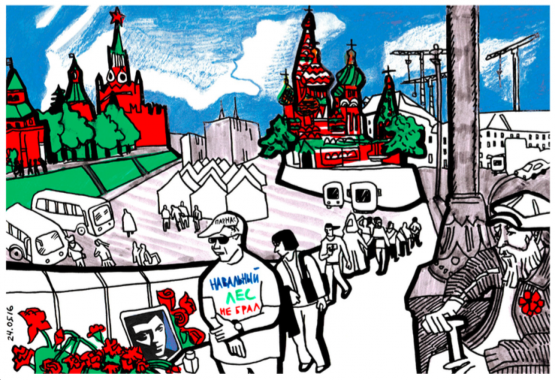 What do two Moscow parks and a truck drivers’ trade union have in common? 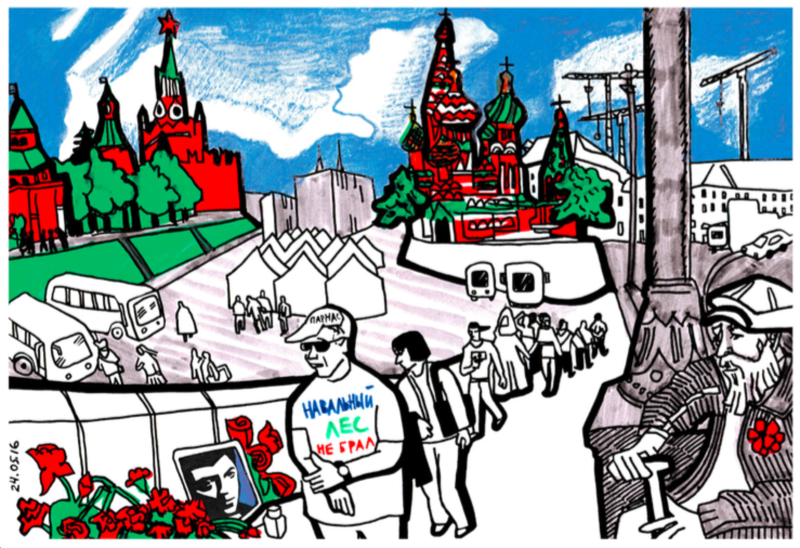 They have been the focus of protests that have shown that the Russian public may be losing its traditional passivity. 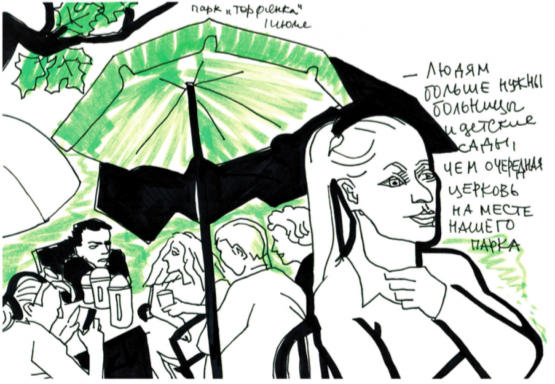 Over the past few years, Russian artist Viktoria Lomasko has travelled widely across Russia, as well as to Armenia, Georgia and Kyrgyzstan. In her many sketches, she has shed light on under-reported issues such as women in Russia’s media and in Dagestani society to the politics of Yerevan’s street life, and Azerbaijani dissidents in Georgia. In this series of drawings, she focuses on recent grassroots protest movements across Russia. A passer-by at the “people’s memorial” to Nemtsov. “[Aleksei] Navalny didn’t steal the timber”, reads his t-shirt (referring to a legal charge against another prominent opposition leader). At the start of 2015 Boris Nemtsov, one of Russia’s opposition leaders, was murdered by unknown gunmen just a few metres from the Kremlin. At the scene of the murder, Bolshoy Moskvorechy Bridge, civil rights activists immediately set up a “people’s memorial”: flowers, photos, drawings, candles. And now, over a year later, they are still taking turns to keep a twenty four hour vigil, protecting the memorial from attacks by members of various ultranationalist-patriotic movements and employees of Moscow’s waste disposal department, who see the flowers and photos as rubbish and regularly clear them away. The mass demonstrations and marches in 2012, led by opposition leaders, with their banners reading “For Fair Elections” and “Russia without Putin!”, ended with trials of not only leaders (Navalny, Udaltsov), but people who just took part in the protests, now known as “the 6th May Prisoners”. In 2015-6, the “Marches of the Millions” were replaced by small rallies and protest actions, with people who were not involved in formal politics trying to fight for specific concrete rights. These drawings, for example, were made at a rally in defence of the Dynasty Foundation, an NGO set up to support Russian science and education that has been declared a “foreign agent”. In June 2015 the residents of Moscow’s Losinoostrovsky district came together to prevent the building of a church in their local Torfyanka Park. The planned construction was part of the “200 Churches” Russian Orthodox Church (ROC) project. The locals set up a tent camp in the park and kept a constant vigil to prevent any construction plant entering it. And they also filed a suit with the district court over public consultations that had taken place without their participation. When I drew the people defending the park, most of them said that was all they were interested in. Not politics. The ROC and the city authorities didn’t expect any resistance. In Russia any successful grass roots initiatives is like a miracle. Cossacks who’d been involved in the fighting in the DNR [self-proclaimed Donetsk People’s Republic – ed.] and members of the Forty Forties Orthodox movement started gathering in the area divided off for the construction of the church (the movement’s name comes from an old nickname for Moscow. In old Russian the word “sorok” – forty – also meant a church administrative district, which consisted of about forty churches). After fighting began in South Eastern Ukraine, TV and the pro-Putin press began to scare the public with talk of “traitors to Russia” and a “Fifth Column”. People who went on anti war marches, for example, were called a “Fifth Column”. 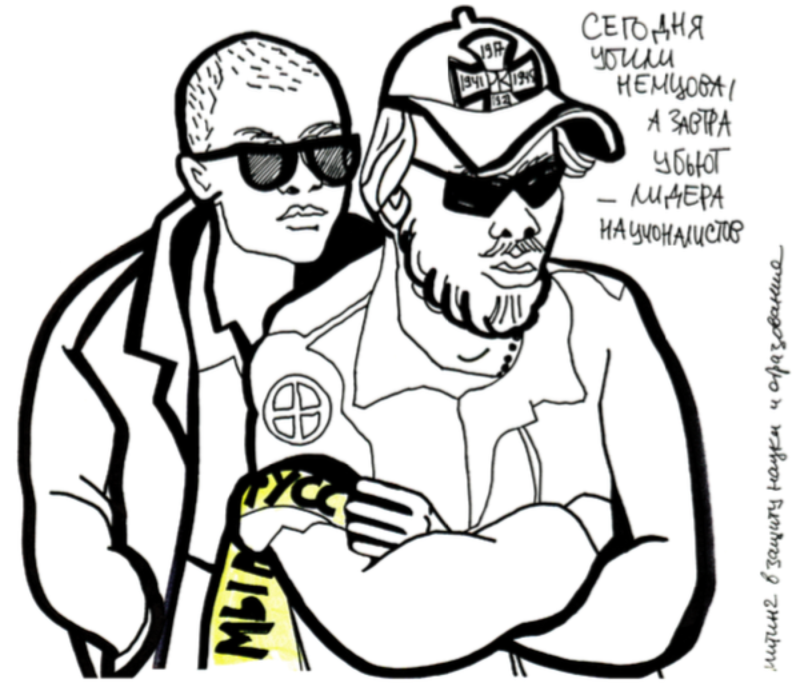 And any protest against the government was compared to what was known in Russia as Kyiv’s “Fascist Maidan”. The park’s defenders told me that only five or six people in the district supported the building of the new church. “We’re Orthodox too and we want a church, but not in our park. There shouldn’t be a church on every street corner, like a bakery”, the protesters explained. They also said that there were people going round the flats scaring elderly residents, saying they would go to hell if they spoke out against the new church. The biggest protest has been among long distance truck drivers. A new law came into force in November 2015, forcing them to pay a toll to drive along federal highways and setting up a special payment system, called “Plato”, to manage and enforce it. According to owners and drivers of HGV vehicles, Plato will relieve them of 400,000 roubles (€5,800) per truck per year, which is equivalent to bankrupting them. In addition, the fine for the first non-payment of the toll was set at 500,000 roubles (€7,250), and 1 million roubles (€14,500) for subsequent defaults. Half of Plato’s toll operating points belong to Igor Rotenberg, the son of Arkady Rotenberg, a billionaire who is a member of Putin’s inner circle. 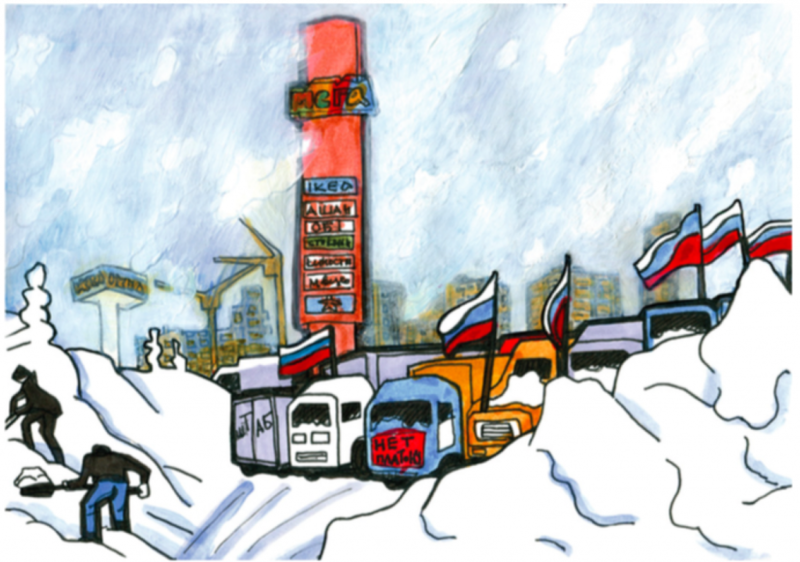 In late November-early December 2015 truckers from several Russian regions converged on Moscow. The police stopped the empty vehicles at the city limits and turned them, back, but about 25 drivers managed to get through and set up a camp at Khimki, 20 kilometres from the capital. On 4 December the law was amended to reduce the first fine to 5000 roubles (€72) and subsequent fines to 10000 (€144). I made my first visit to Khimki just before New Year. It was at a weekend, and more and more people were turning up to support the truckers and bring them food and diesel. The drivers thanked them, but looked rather wary. “In the early days we all kept our distance and were suspicious of everyone as we didn’t know each other”, camp coordinator Sergey Vladimirov said a month later. 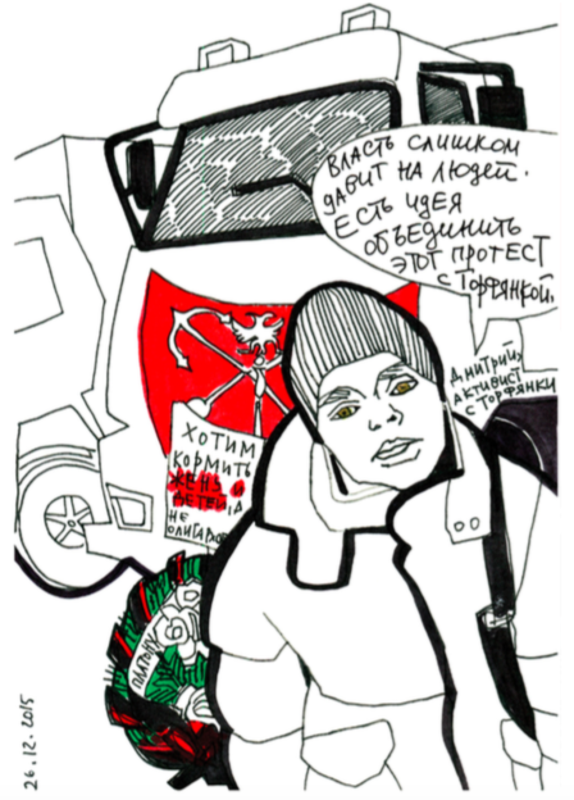 I sketched a portrait of Andrey Bazhutin from St Petersburg, who was soon to become the protest’s leader. I saw how confused he was: “We’re holding a strike here, but five metres away people are getting ready to celebrate New Year …” Beside Khimki’s enormous shopping centres and the thousands of Muscovites coming to do their party shopping, the trucks with their protest placards looked a bit marginal. “Everyone will wake up to the camp after New Year, but the truckers will be gone. We need support now,” says Andrey. At the Khimki camp I bumped into one of the Torfyanka protesters, who was really inspired by what he saw. But the truck drivers were only interested in getting Putin’s attention and getting rid of the Plato system, so that they could get back to their normal lives. “The government is squeezing people too hard” says Dmitry, an activist. “There’s an idea that this protest might merge with the Torfyanka one” “We want to feed our wives and children, not the oligarchs”, reads a placard on the truck behind him. “It’s not about politics”, the truckers told anyone who came to the camp. As one of them said, “If you want to make political demands, you need to get your head around politics”. Meanwhile, on the social networks leftists and liberals were debating whether to support the truck drivers. Many of them were disappointed that the drivers weren’t starting a revolution. “My friends were scaring me; they said the truckers were zombies”, says Tamara. “But they don’t even know us”, responds one of the truckers. In her blog on the Ekho Moskvy site, Eydelman commented on her trip to meet the truckers: “I looked around and saw that they were actually interested. I realised these were not wild savages, but people with intelligent faces, attentive to what I was saying”. 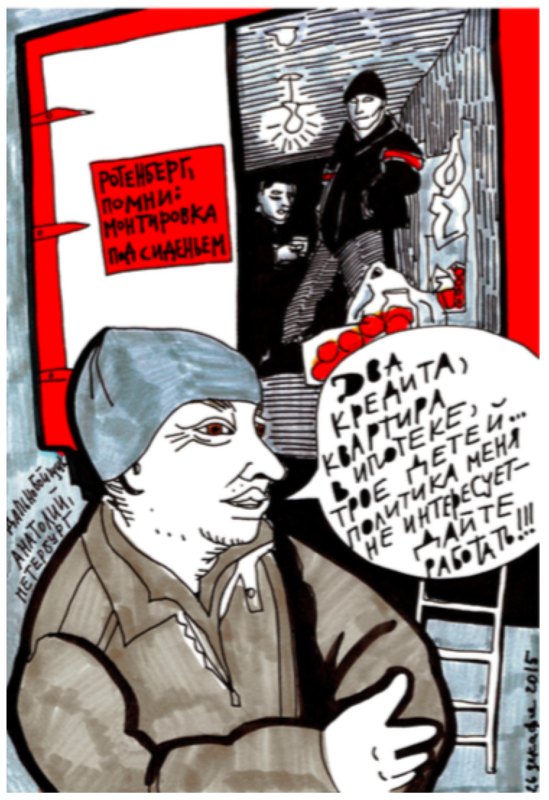 “I’ve got two loans, a mortgage on the flat and three kids to feed… I’ve no interest in politics; just let me work!” says Anatoly, a trucker from St. Petersburg. The liberal media – RBK, Novaya Gazeta, Meduza, Dozhd, Colta – covered the drivers’ action regularly, but there was very little coverage on TV, and PM Dmitry Medvedev called them “ignorant truckers” who “didn’t even know what they were transporting”. This led the drivers to stop trusting Russian TV and start reading online news sites instead. After New Year, the truckers created their “headquarters”: they set up a table, stools, a gas stove and shelving for their stocks of potatoes and grains in one of the trucks. Visitors started coming and almost all of them tried to help in some way. For example, Ivan, an economics specialist who lived close by, would regularly bring the drivers a hot meal he had cooked himself. “It’s not a lot”, he told me, “but since I’ve started it, I’m sleeping better at night. I also met the truckers’ press officer Tasya Nikitenko. This 19 year old student at the Institute of Journalism and Creative Writing came to the camp on her own initiative and spent two months there, helping the truckers deal with the media. “When the bells started ringing to bring in the New Year, we listened to speeches by truckers, not Putin”, says Ivan. Ivan brought in the New Year in the camp – activist Pavel Pechnik and his mates organised a proper celebration for the drivers. “There was a big table with home cooked food”, he told me. “I expected it to be good, but it was fantastic. I was with these strangers but they felt like family”. The winter days were dark and cold. 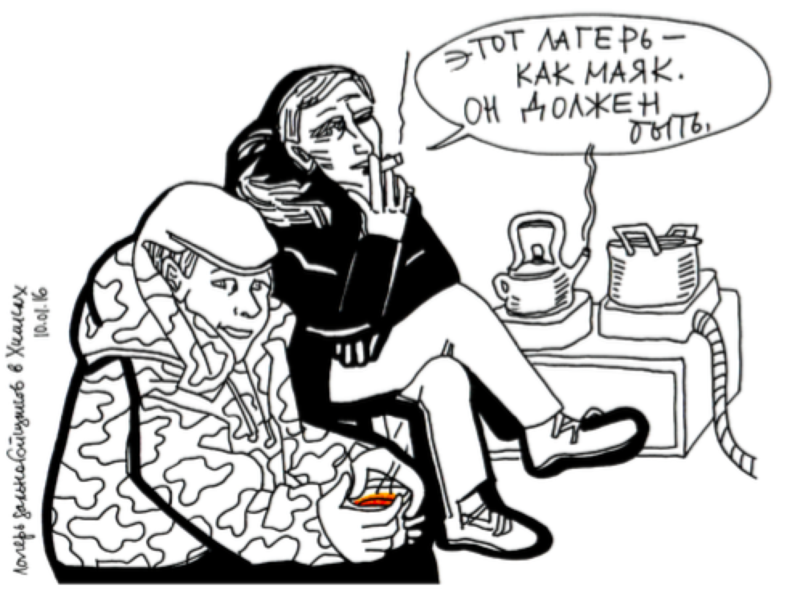 The truckers and their guests sat in the “headquarters” in hats, coats and furs, warming themselves with plastic beakers of hot tea and arguing about philosophy, history, veganism, the environment and politics. 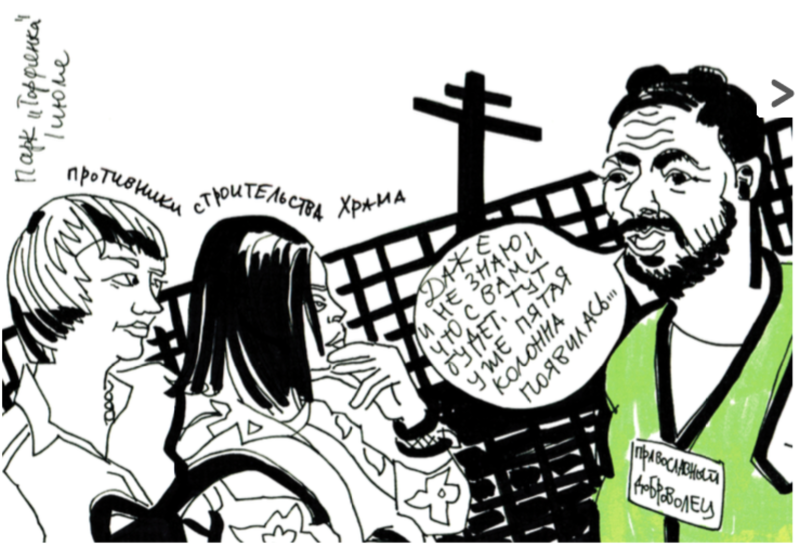 The young businessman in the drawing visited the camp several times and gave the truckers money for diesel. The camp survived on donations (they had opened a savings bank account) but many drivers still fell into debt and had to sell their cars. Yelena, a journalist, wrote about what was happening in her Facebook group “The truckers’ coordination – no Plato”. Singer Tatyana organised concerts at the “headquarters” and invited the truckers home to have a shower and wash their clothes. Lawyer Katya helped with money and legal advice. 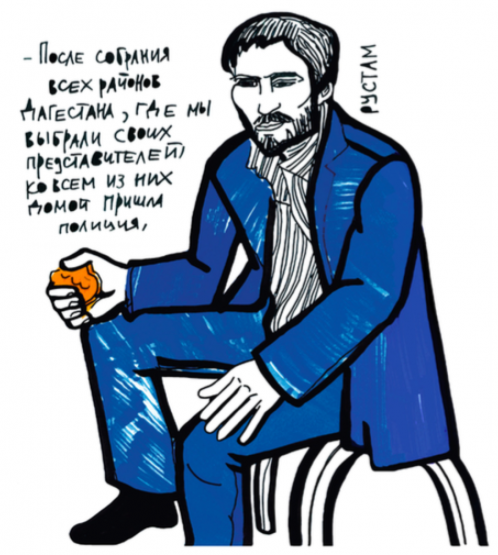 “Thanks to Plato and Rotenberg, we’re now founding a real trade union”, says Anatoly. Anatoly, a trucker from Khanti-Mansiysk, told me how they tried to fight Plato in his region: “We held a protest in Surgut. A helicopter flew over us and then the riot police dispersed everyone. That was it. I decided that if you can’t do anything at home, you need to come to Moscow”. Anatoly and his friend Sergey came by car: “nobody would let us in here in a truck. If you break the law, you lose your licence”. Andrey Bazhutin, the truckers’ leader, told visitors how life was changing in the camp: “The first few days were chaotic, but now we’re as disciplined as soldiers. We know what’s newsworthy and what’s not; we’ve learned how to give an interview and there’s such a demand for them that it feels we’ve been doing it all our lives”. At first the truckers, unhappy with their existing trade union, wanted to organise a new one. But that turned out to be impossible, since many of them are both employers and employees. So they decided to set up an association of transport operators. All decisions were taken at closed union meetings. In Shenkursk, a small town with a population of 5000, more than 50 truck drivers and owners joined the union. “Truck driving is the main occupation here”, says Kirill from Shenkursk. “There’s no other work around”. The biggest trucker strikes have been happening in Dagestan: Manas, Kayakent, Khasavyurt, Kizkyar. 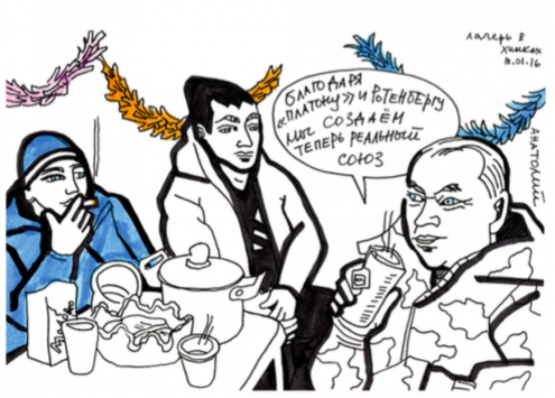 In November, when the anti Plato protests started, Dagestani drivers also headed for Moscow. The truckers from southern Russia stopped at the 91st kilometre from the capital, on the Kashira highway, and were there for three weeks. On one visit to this “southern” camp I met the the Dagestani truckers’ acting union representative Rustam Mallamagomedov. After a few weeks Rustam discovered, by accident that he was wanted by the police as the organiser of an “unsanctioned rally”. “After our representatives were elected at meetings all across Dagestan, the police came to visit them at home” says Rustam.“Ordinary people support us”, Sergey, another Dagestani trucker told me. “They realise that if transport is more expensive, goods will be as well. Dagestan imports a lot of bananas from Iran; they used to cost 23 roubles a kilogramme, but since the new transport regulations it’s gone up to 29-30 roubles”. I met Sergey again at the Khimki camp. He wasn’t happy. “The guy I work for is selling his truck tomorrow. There’s no profit in it anymore. The internet is full of ‘truck sale’ posts”. The only woman in the camp is Nadezhda, from Vologda. She used to work in the public housing and utility sector, but left “because the whole thing was corrupt”. She owns two trucks and has been in the camp since Day One. “I’m grateful to Plato for introducing me to so many different people here”, she says. But Plato is not the truckers’ only problem. Another serious one is getting orders through middlemen. As they explained to me, “the dispatchers sit on the phones; they each control several trucks, so it makes sense for firms to sign contracts with them. We, the drivers, haven’t been able to agree among ourselves about rates. The dispatchers put tenders together amongst themselves, and if they don’t have any trucks they pass the order on and take their slice each time. In the late 1990s and 2000s dispatchers creamed off 5-7%, but now no one knows how much they’re taking. Many truckers believe they take 50-80%. Another problem is danger on the roads. “The racket is back. They open the trucks, just like in the 90s. 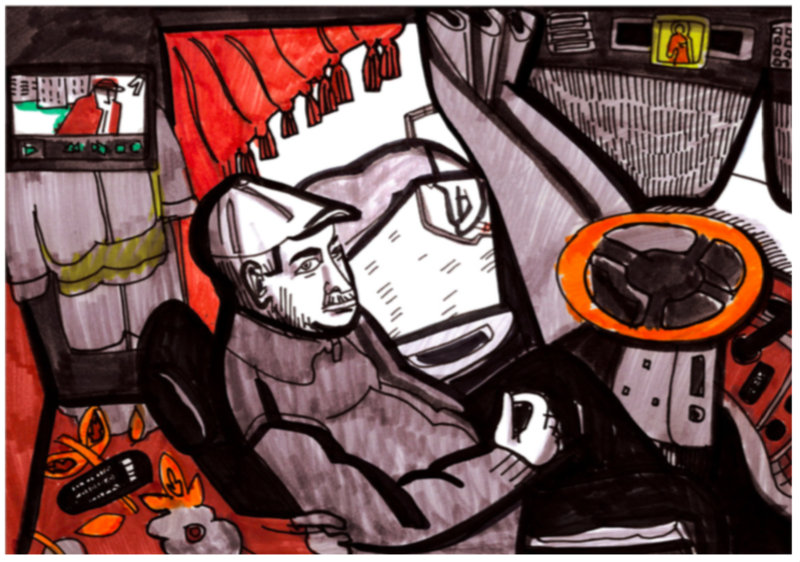 I try to stop at paid truck parks, or places I know are safe”, says Oleg.